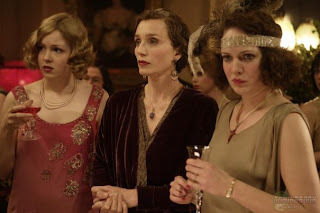 Easy Virtue" (Sony Classics) is a glossy but dramatically uncertain retread of an early Noel Coward play (1924), adapted by Australian director and co-writer Stephen Elliott of "Priscilla, Queen of the Desert" fame. Though not one of Coward's best, it was still enough of a hit on both sides of the Atlantic to be brought to the screen as a silent film, directed by none other than Alfred Hitchcock, long before honing his image as the master of suspense. The basic plot is this: A landed young Englishman, John Whittaker (Ben Barnes), brings home his vivacious new bride, the glamorous American Larita (likable Jessica Biel) -- in the play a divorcee, but here a widow -- who clashes with her husband's stodgy mother, Mrs. Whittaker (Kristin Scott Thomas), and repressed sisters. (In the play, one was a religious fanatic.) Larita is a woman with, as they used to say, a past. She wins the admiration of John's more bohemian father, Mr. Whittaker (Colin Firth), and bonds, quite improbably, with his childhood sweetheart, Sara (Charlotte Riley in her film debut). The latter is clearly the more suitable match for the at-heart traditional groom. Country life proves anathema for the free-spirited Larita, who predictably comes to feel constricted by the stodgy and "conventional" family. John is almost persuaded to take her abroad until, that is, his mother reveals that the family is nearly bankrupt. The colorful period and background tunes are enjoyable in themselves, if cliched (Coward's own "Mad About the Boy" and Cole Porter's "Let's Misbehave"), some performed by Biel and others in the cast. But despite a lush production design, performances are, sorry to say, generally flat, and no one -- not even the estimable Thomas -- is at his or her best here. Despite some flashy filmic touches from Elliott, "Easy Virtue" seems dated, and in trying to turn a drawing room tragicomedy into a breezy romp registers as false to the original. The rickety old Hitchcock film -- which plays as pure melodrama -- is, in fact, closer to the mark.